My post of October 11 mentioned that China's Shanghai Index broke below a major monthly swing low level of 2638.30 and that it could be headed for its next major support level at 2260, or lower. Since then, price has fluctuated in both directions and has been attempting to stabilize, but remains just below that former swing low...a potential major inflection point. Overlayed on all of the following three charts of the USD/CNY forex pair is the Shanghai Index (shown in pink). After price peaked in January of this year, it began an 1,140 point decline, in divergence with a rally in the USD/CNY. The following monthly chart of the USD/CNY forex pair shows that its price is also now at a potential inflection point...the last swing high set in January 2017, following the November 2016 U.S. Presidential election. 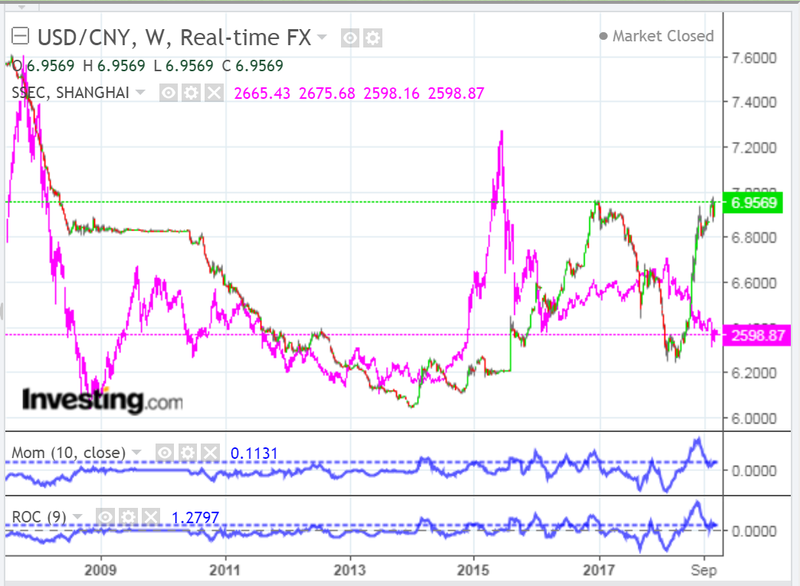 Both the momentum (MOM) and rate-of-change (ROC) indicators (of USD/CNY) have surpassed the January 2017 highs and are at historical highs on this timeframe...hinting at further strength on this timeframe. 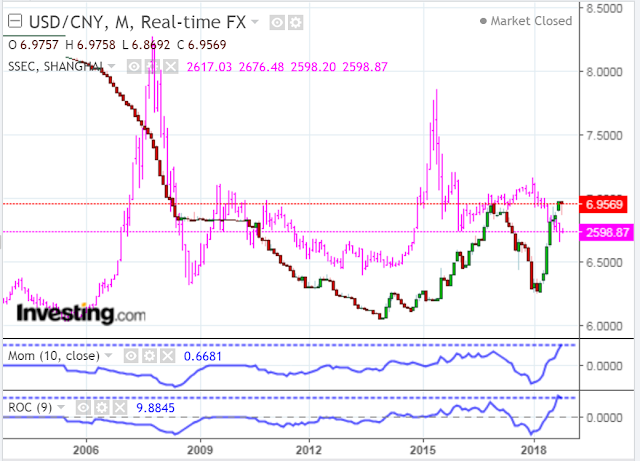 On a weekly timeframe, both the MOM and ROC (of USD/CNY) have declined and remain just above the zero level in divergence with this latest price bounce, which began at the end of August...hinting at a potential pullback on this timeframe. 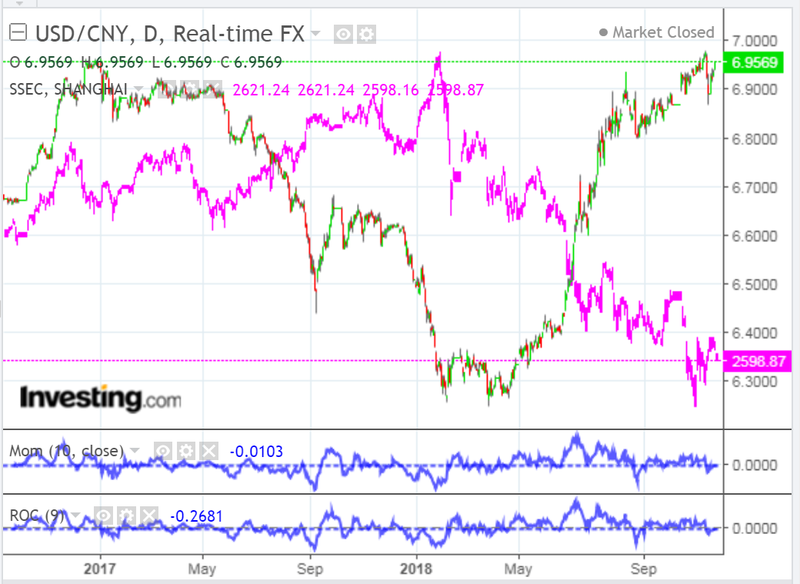 On a daily timeframe, both the MOM and ROC (of USD/CNY) have declined and are just below the zero level in divergence with this latest price bounce, which began at the end of August...hinting at a potential pullback on this timeframe. 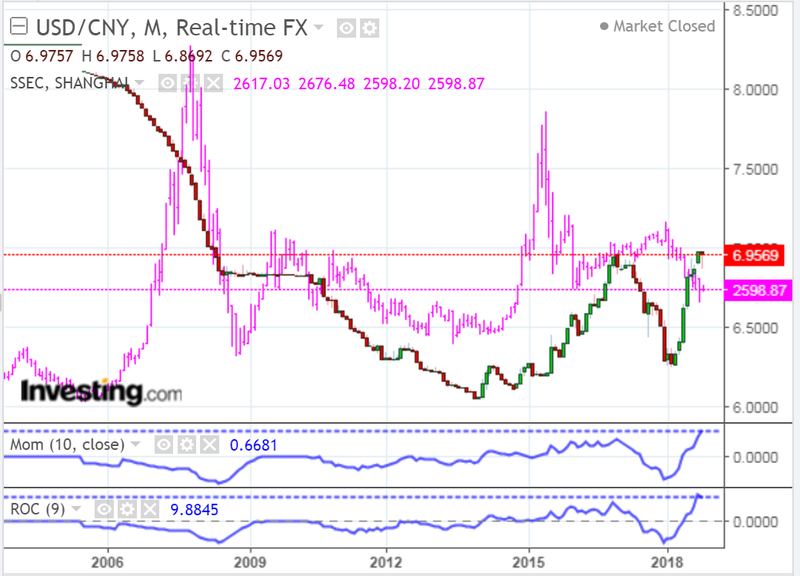 In conclusion, both the Shanghai Index and the USD/CNY forex pair are at or near potential inflection points, so it's worth keeping an eye on both to see whether they, either continue to diverge, or whether they both reverse and begin to converge in the near term. In this regard, monitor the action of the MOM and ROC indicators around their respective zero levels on both the daily and weekly timeframes for clues on direction and strength in the short and medium terms. As an aside, it would also be interesting to hear whether any chatter arises about whether President Trump declares that China is manipulating its currency any time soon -- which seemed to have been discussed, then dismissed, following the 2016 election -- and whether, and to what extent, such talk affects both the USD/CNY and Shanghai Index. Will U.S. Markets Rally Or Tank Into Year End? Will The FAANGs Lead U.S. Markets Up or Down?